This pen popped up for sale on Twitter, via Dan Smith, one of the FPGeeks. The price was right, and I had a hankering for a red pen, so I asked Dan if it was still available. It was. Done deal. 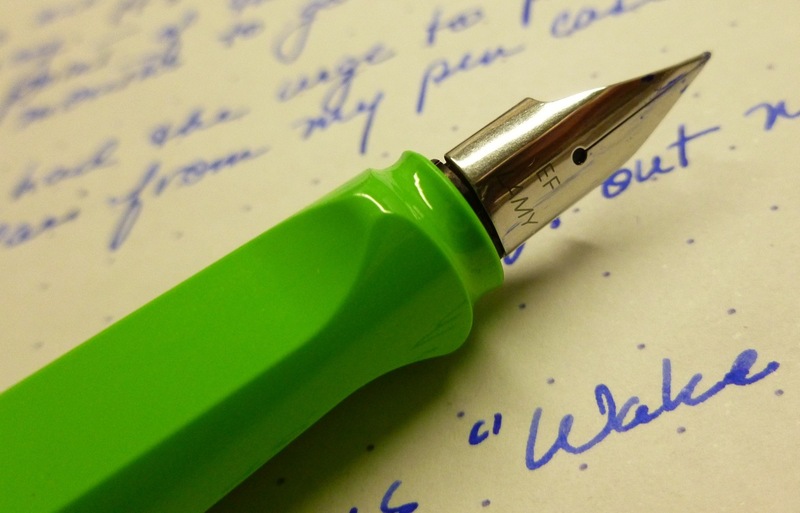 I recently posted a review of the Limited Edition Apple Green Lamy Safari, and the AL-Star is basically the same pen, but with an aluminum body, so I won’t rehash the details found in that review. I did neglect to mention a couple of features, though, so this is a chance to make that right. Neglected detail #1: The ink window. Found on the Safari and AL-Star models, this body cut-out gives you a peek at your ink supply so that you’re not surprised by an empty tank. Neglected detail #2: The grip. The contoured grip. 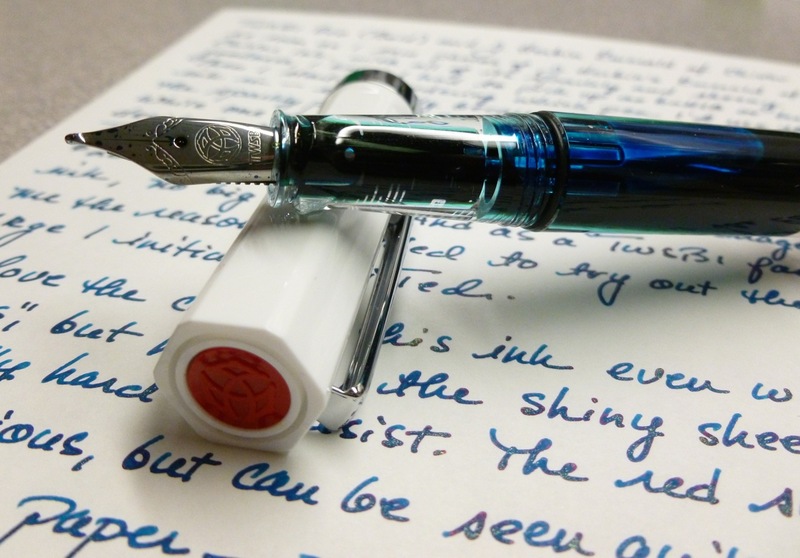 Some people love it, some people hate it, because you’re forced to hold the pen in a very specific way. If it works for you, you’re golden. If not, you might want to steer clear. 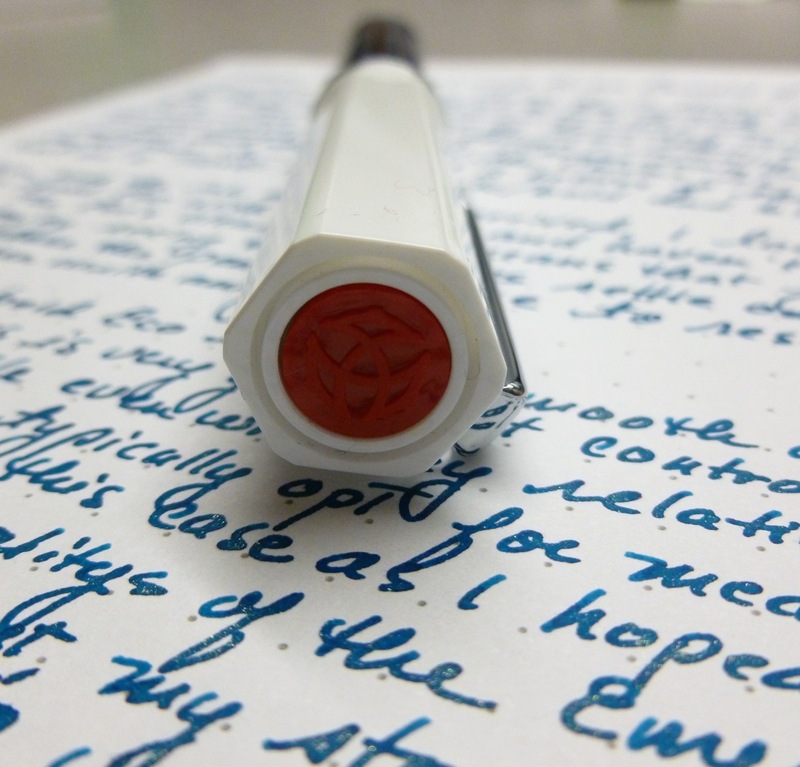 Personally, I don’t mind the way the grip (transparent plastic, in this case) dictates where your fingers are placed, as it’s helped me achieve a more consistent writing grip. I don’t find it annoying, but others do. 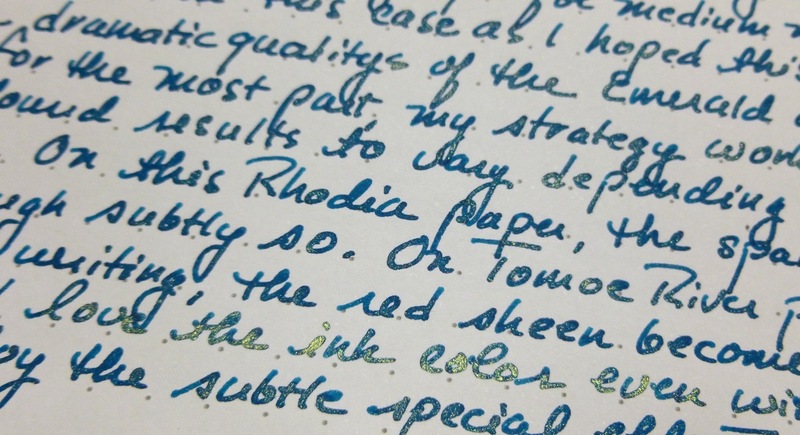 Aside from the sweet price and color, I was intrigued by the 1.1 mm stub nib. I usually go fine, and have a growing collection of mediums, but no broads, and no stubs. I’m a true novice. Time to change that. 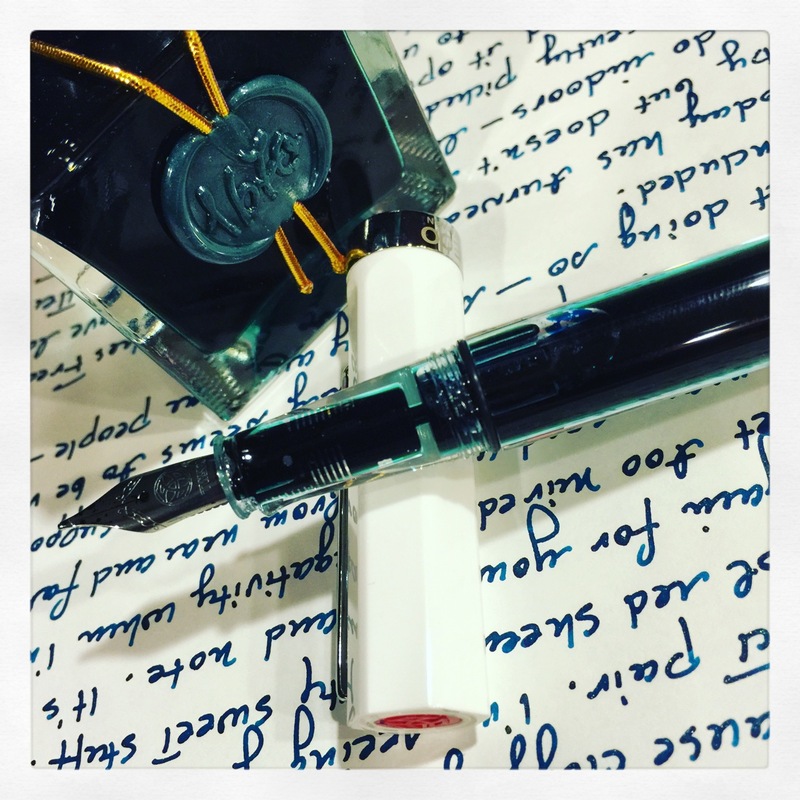 Inked with J. Herbin’s Eclat de Saphir, this pen and its juicy nib inspired me to write more than my usual pen-testing scribbles. The nib is so smooth, and so…um…NOT fine, that I had to write something more substantial than my name and the dogs’ names. 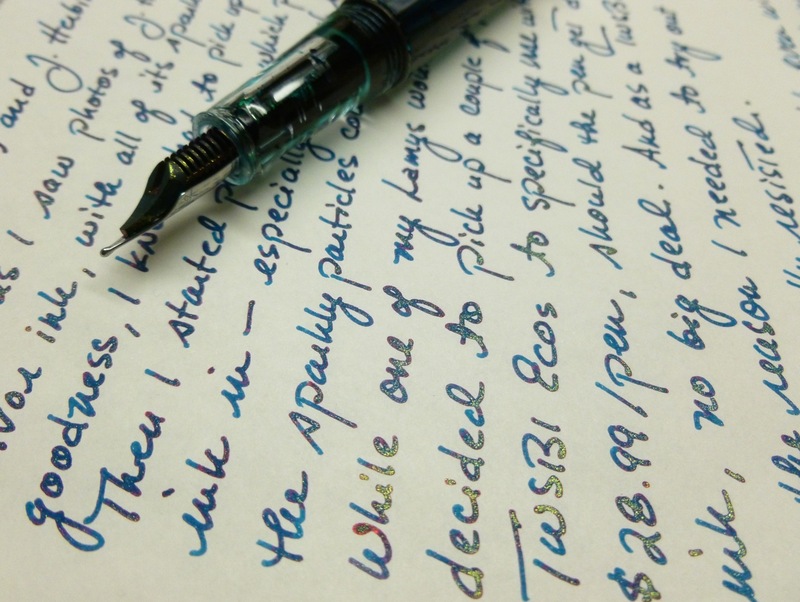 Man, I love how this feels, and how it bumps up my handwriting a notch or two. And I love how words seem more substantial, more meaningful. 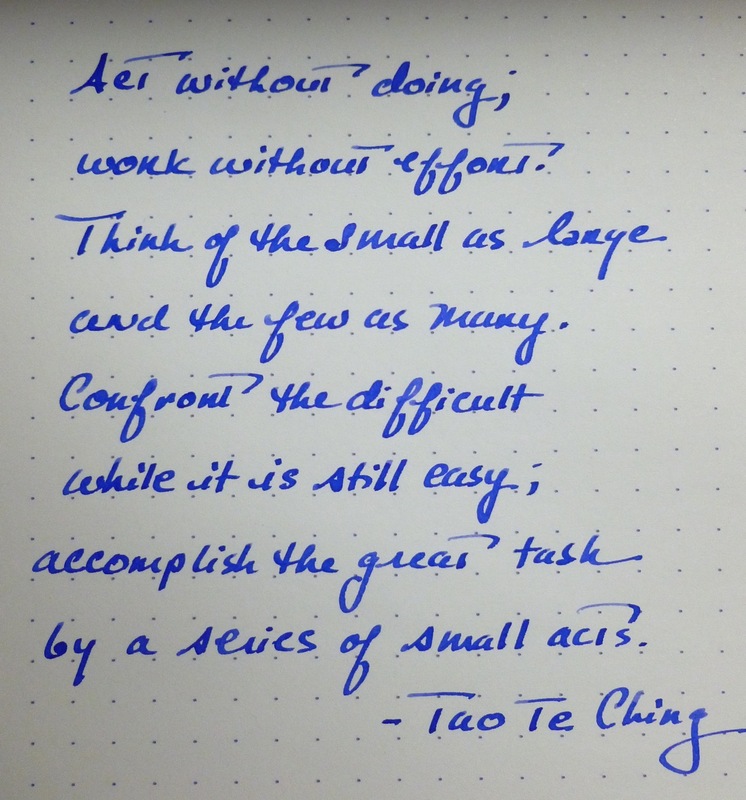 I’ve had a less than stellar work day, and I think I did the opposite of everything the Tao says. I worked with effort. I made the easy difficult. I thought of the small as large. I’m tired, but still inspired. Inspired by a red pen with a stub nib. Inspired by blue ink. Inspired by those words. My cousin and I are a lot alike. We both tend to gravitate towards “earth colors” and muted tones. Karen once joked that her autobiography should be titled My Life Is Beige, as she stood in a check-out line with a fistful of khaki-colored and taupe socks. So could mine, Karen. So could mine. 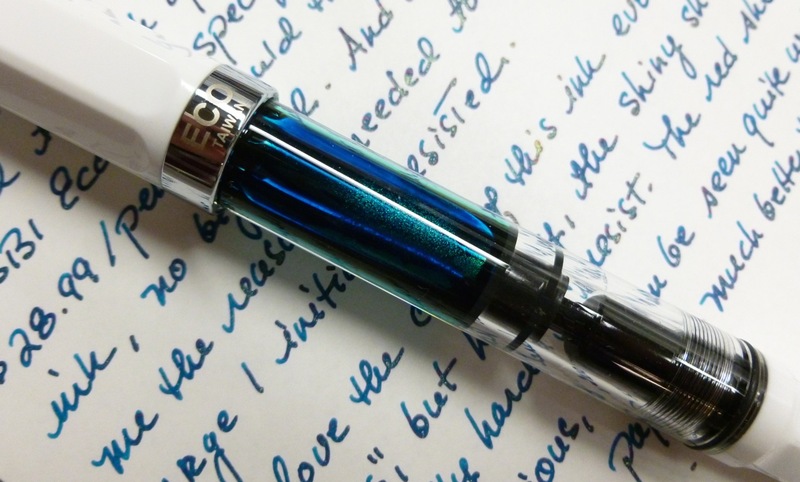 When I select pens, I often gravitate towards the subtle or stealthy colors…matte black, gunmetal, and the like. (I think it’s genetic.) There are exceptions, to be sure, like the Edison Collier Persimmon Swirl, which is eye-poppingly gorgeous. And very bright. But generally speaking, I’m drawn to the blacks and silvers and subtle patterns. But not this time of year. The Christmas lights are quickly disappearing and the skies are a dull grey. It’s easy to start feeling very BLAH at this point in the winter, especially because we still have months of limited sunlight left. Maybe that’s why I had the urge to start using my Apple Green Lamy Safari this week. It’s anything BUT blah. Subtlety is NOT its strong-point. Want some sunglasses with that pen? 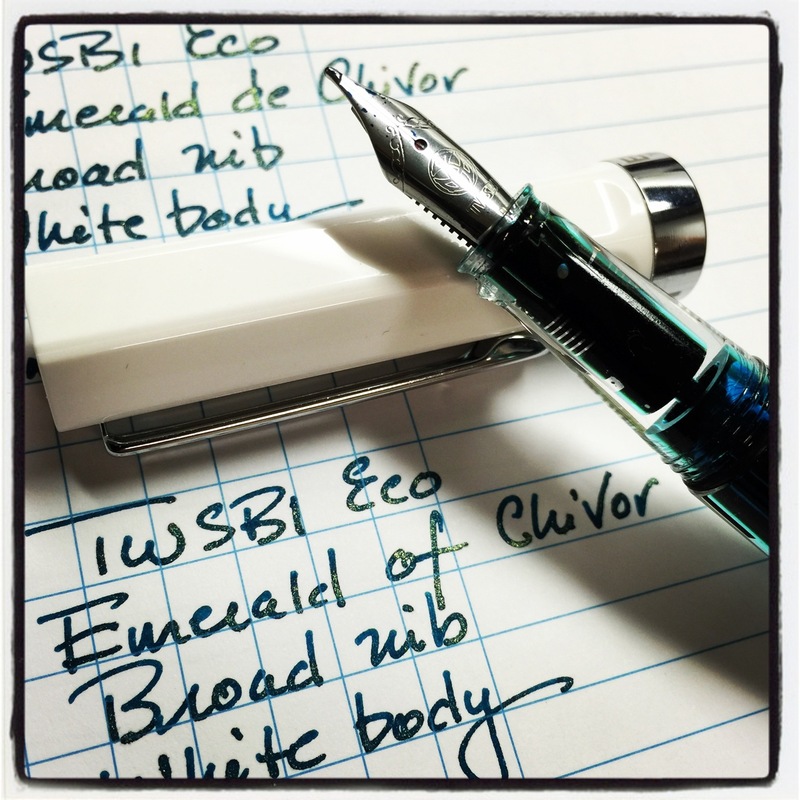 The EF nib on the Safari is no-nonsense, quite stiff, and very plain. I’ve gotten used to seeing nibs with curlicues, scrollwork, and logos, and there’s none of that here. 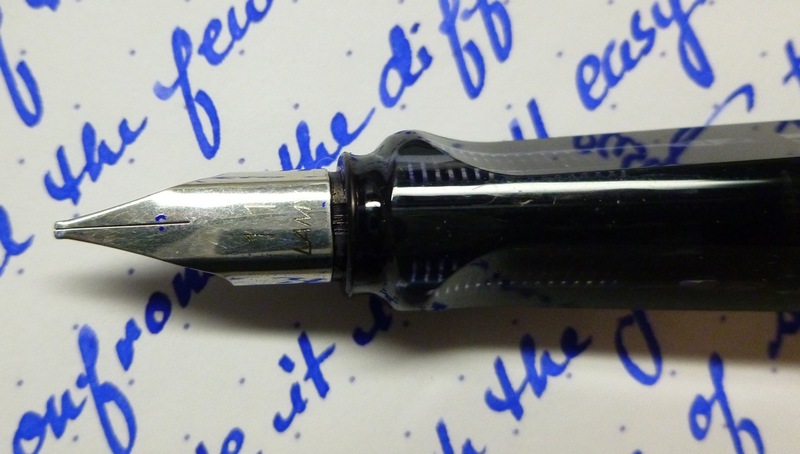 The Lamy Safari nib is a real workhorse that never fails to do its job. 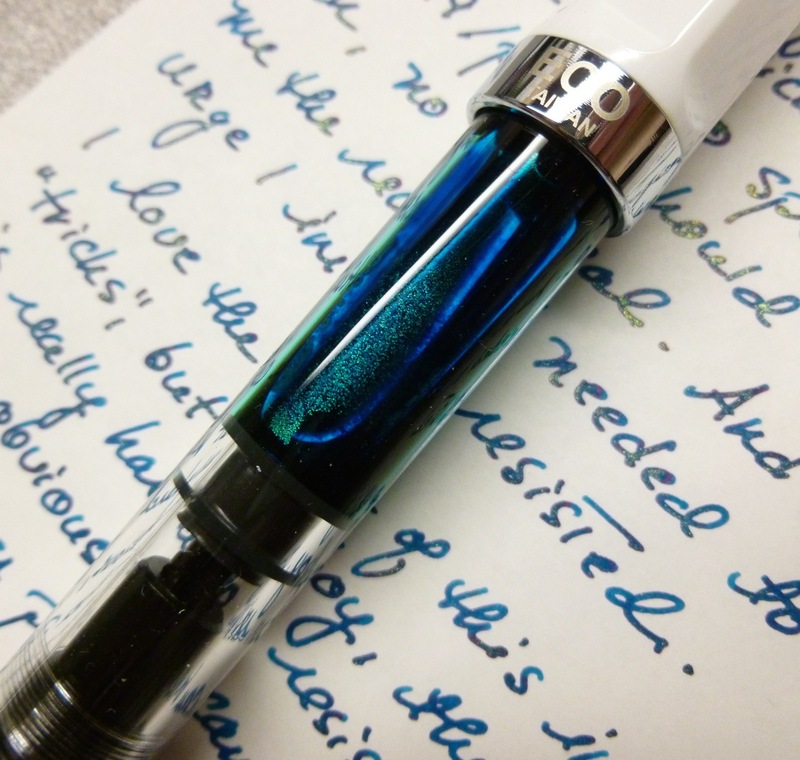 I filled this pen with J. Herbin’s Eclat de Saphir, a favorite blue. 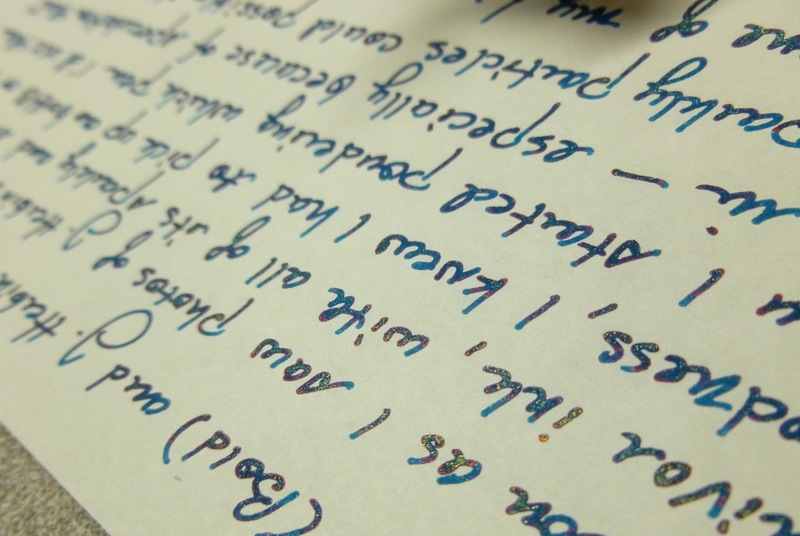 The combination of the neon green pen and warm, lovely blue ink just POPS. SO, here we are mid-January, and I’m holding a pen that screams “WAKE UP! !” And while I’m writing, I do.